More than 60 people squeezed into the Columbia Crossing River Trails Center last evening to get a glimpse of the River Park Phase III Expansion Planning project. 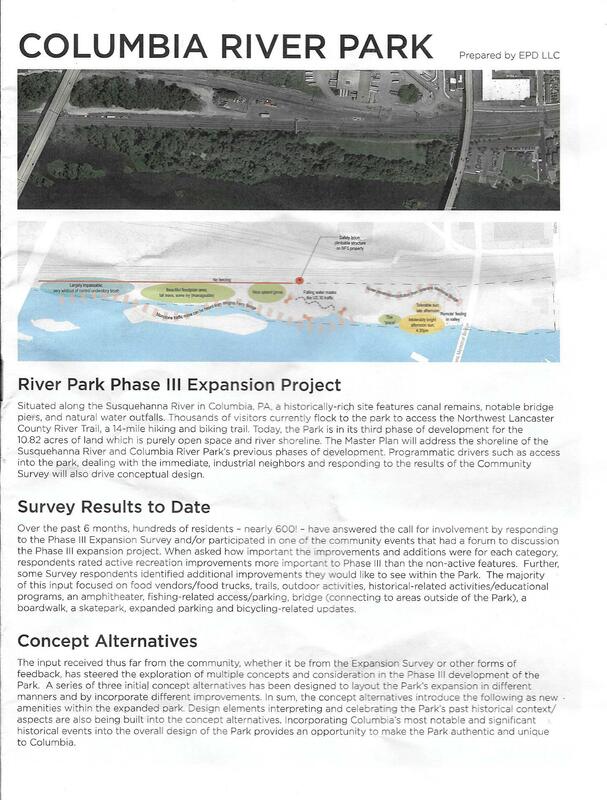 Among the assembled were the mayor, nearly all the borough councillors, the borough manager, members of the Columbia River Advisory Committee, a presentation team from the consultancy firm, Environmental Planning and Design (EPD LLC) who unveiled three options of a concept plans for the park’s continuation north of the Route 462 bridge. 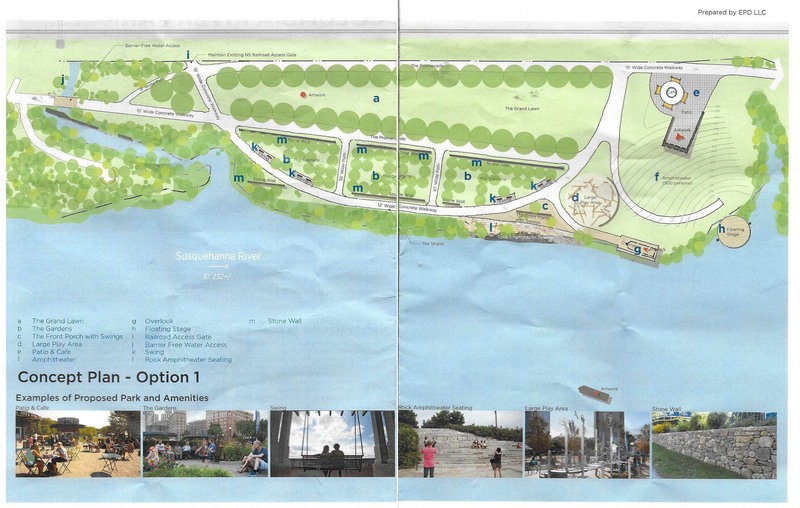 EPD LLC was awarded the contract “for the completion of the River Park Phase III Site Development Project with a cost not to exceed $90,000 according to the meeting’s minutes. 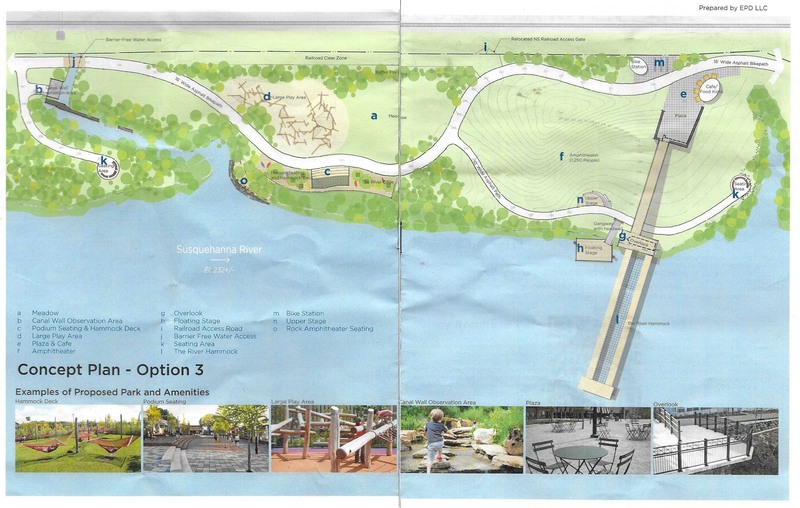 Columbia Borough’s Website shows the borough received a $45,000 DCNR (Pennsylvania Department of Conservation and Natural Resources) Grant (for) River Park Phase III Master Site Plan at this Webpage. EPC LLC posted a photo of last night’s meeting at its facebook page. The community meeting began at 6:30 pm as Rebecca Denlinger, borough manager, cited the reason the meeting. She referred to the results outcomes of a previous citizens’ and visitors’ survey fielded earlier this year and she introduced representatives from EPD LLC who provided historic, environmental, cultural, adjacency situational, social and a range of perspectives and challenges before introducing three Concept Plan options. At the conclusion of the meeting, following a series of questions, observations and comments from the meeting attendees, a handout featuring each of the options was available. We scanned the options for this article, though a clearer version will be posted on the borough website. These scans can be enlarged by clicking on the graphics below.